Additional ways to target my ads? Sign me up, it’s a no-brainer to do. It allows us to segment better and control our ad spend and see where better results come from with some additional bidding features. 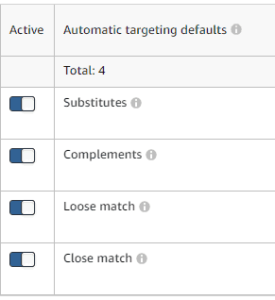 Previously auto campaigns were a black hole, and could only be managed with negative keywords and bidding. We used them historically for keyword discovery. – Substitutes: We’ll show your ad to shoppers who view the detail pages of products similar to yours. – Complements: We’ll show your ad to shoppers who view the detail pages of products similar to yours. – Loose match: We’ll show your ad to shoppers who use search terms loosely related to your products. – Close match: We’ll show your ad to shoppers who use search terms closely related to your products.